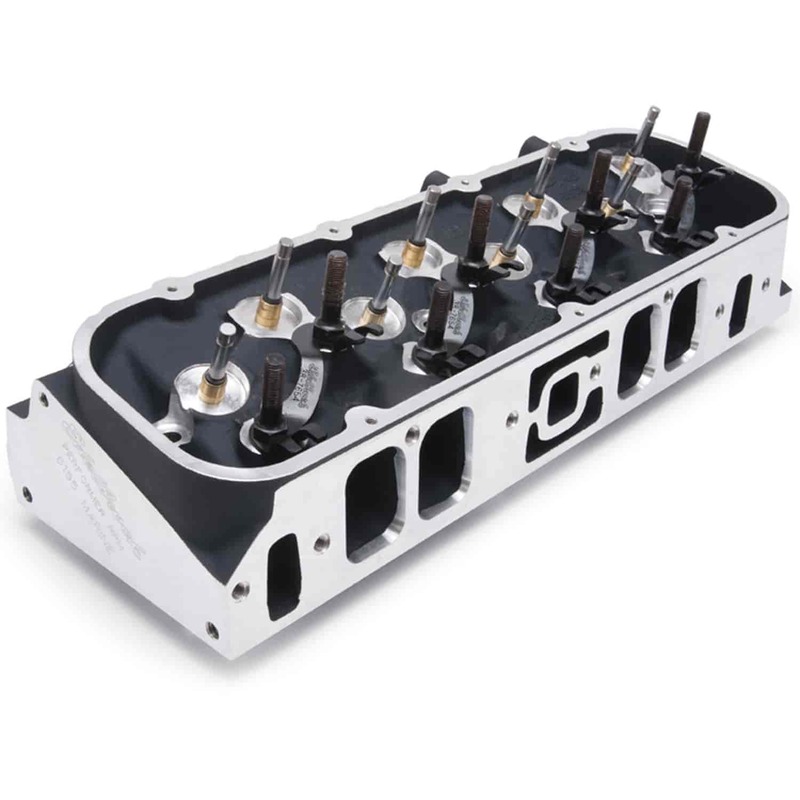 These Edelbrock marine cylinder heads include severe-duty, 1.89'' inconel exhaust valves for the added durability needed in marine applications and have one-piece stainless steel 2.25'' intake valves with hardened tips and swirl-polished heads. Edelbrock Marine heads come with valves and seals only. These oval port heads will support over 540 hp with 9.5:1 compression when used as part of the Edelbrock Total Power Package. The unique oval intake port shape produces flow similar to rectangular ports, but the smaller port size provides excellent seat-of-the-pants performance and crisp throttle response. The semi-open chamber design maximizes efficiency with streetable compression ratios and the smaller-than-stock 11/32'' valve stems promote excellent flow and lighter valve weight. These oval port heads are similar to the ones above with 100cc semi-open combustion chambers created by angle milling at a 1.5 degree angle to improve intake port alignment and create a smaller chamber without valve shrouding. They create an ideal street compression ratio of 9.2:1 when used with flat top pistons. Smaller-than-stock 11/32'' valve stems promote excellent flow and lighter valve weight. These rectangle port heads are designed for street/high-performance big-blocks operating from 2500-7000 RPM. The specially designed ports offer increased flow and velocity over standard big-block heads. These heads feature highly-efficient 118cc open-style combustion chamber and high-velocity 315cc long/300cc short intake ports. Smaller-than-stock 11/32'' valve stems promote excellent flow and lighter valve weight. The Marine Performer RPM heads feature heavy-duty, 1.89'' Inconel exhaust valves that provide added durability for marine applications. They are hard anodized to protect the aluminum in the harsh marine environment. These heads use smaller-than-stock 11/32'' valve stems to promote excellent flow and lighter valve weight. Match them with an Edelbrock Performer RPM manifold, Performer Series 750 cfm marine carb and Performer RPM cam for proven high-performance! Intake Valve Diameter 2.19" 2.19"
Exhaust Valve Diameter 1.88" 1.88"
Valve Spring Diameter 1.55" 1.55"
Valve Spring Maximum Lift .700" .700"
61559 - Edelbrock Performer RPM Aluminum Cylinder Heads for Big Block Chevy is rated 5.0 out of 5 by 1. Rated 5 out of 5 by BROTHERSKEEPER from MAKE BIG POWER THESE HEADS WITH A LUNATI FLAT TAPPET SOLID CAM VOO DOO SERIES. ON A 4.250 STROKE X4.250 BORE 10.5 COMP BBC INT RUNNERS OPENED UP TO 2 1/8 WIDE X2 5/8 IN TALL MAKES BIG POWER FROM 2000 RPM TO 7000 RPM CAM IS 267/276 572/592 WITH 1.8 ROCKER LIFT GOES TO 602/622!